The Bahamas consists of over 700 islands and is one of the premier fishing destinations in the world. Just 50 miles southeast of Florida USA, this island nation boasts of some of the best fishing to be found anywhere. With year-round temperatures ranging between 75 and 84 degree Fahrenheit (24-29 Celsius) and over 100,000 square miles of crystal-clear blue waters, fishing in the Bahamas is paradise. The gulfstream nutrient-rich waters of the Bahamas attract schools of fish and giant predators alike. The fishing opportunities are abundant, ranging from fly fishing the flats for bonefish and permit to chasing big game, rod bending brutes such as Wahoo, Sailfish, Mahi Mahi and, of course, monster Blue Marlin as well as Bluefin Tuna. There’s nothing more thrilling than being hooked into one of these 1000 lb monsters of the deep blue. In fact, the Bahamas is well known to big game fisherman throughout the world for its big record catches. Fishing charters are plenty on the islands. Grand Bahama Island and Nassau are famous for their accommodations and expert big game charter fishing . There you will find captains who know where the fish are and can have you trolling for Yellowfin or put you right over some of the best reefs in the world and bottom fishing for giant Grouper, Snapper, Amberjack and more. If you would like to get away from the crowd, perhaps one of the Bahamian Out Islands is for you. One of the Out Islands best fishing grounds is the Bimini Islands, one of famous author and avid fisherman Ernest Hemingway’s favorite big game destinations. Bimini , the closest of the Bahamas Island to the United States, offers the sport fisherman world class Tuna and Marlin fishing. 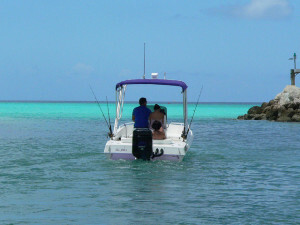 Here too you will find experienced fishing guides and Bahamas fishing charters who will put on onto the action fast.